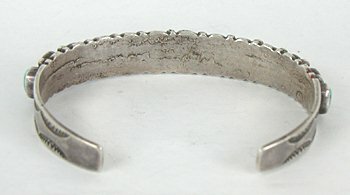 This entry was posted in Age, Authenticity, Belt Buckle, Bracelets, Classic pre-1930s, Coin Silver, First Phase, Fred Harvey 1900-1955, Pawn, Silver, Sterling Silver, Transitional Period, Value and tagged bracelet, classic, coin, coin silver, cuff bracelet, hand forged, hand hammered, ingot, native american, navajo, pawn, sterling silver by Native American Jewelry Tips. Bookmark the permalink. You are absolutely incredible! Thank you for sharing your knowledge and expertise in the world of Native American jewelry. So glad to read this article! I’ve long heard of ingot pieces, and I have a few in my collection, but I often wondered about the steps in creating these pieces and how exactly to recognize them. Thanks for such valuable information.